How much do we love Amazon giveaways especially when the prize is a whopping $750 Amazon gift card? Yep, a lot! 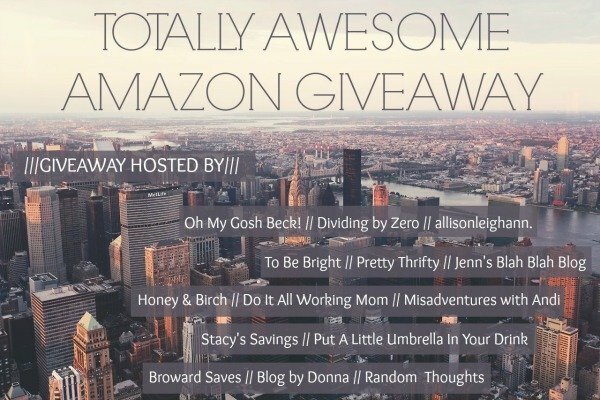 This is why I have teamed up with a group of bloggers to offer you the chance to enter the Totally Awesome Amazon Giveaway! Simply enter via the Rafflecopter below and be sure to bookmark this page and come back daily to enter and increase your chances of winning. Plus you can earn bonus entries by sharing this giveaway with your friends on social media. This giveaway ends October 3. Good luck! For more fun giveaways follow Freebie Finding Mom’s Giveaways, Contests, and Sweepstakes – Oh My! Pinterest board. Rules: Use the Rafflecopter form to enter daily. Besides the mandatory blog comment entry, all other entries are optional. Giveaway ends 10/3 and is open worldwide. Last thing I bought on Amazon was a nap mat for my grandson to use at preschool. i buy all my wipes, diapers, training pants from Amazon – loving the Amazon Mom! The last thing I bought from Amazon was my textbook for Econ class. The last thing I bought from Amazon was the book “Raising Real Men” by Hal and Melanie Young. Awesome! The last thing I bought from Amazon was a bath cushion for my 2 month old son. The last think that I bought on Amazon was a book. I would love to win! I would buy a new car seat, a battery and charger for my sons power wheels fourwheeler and new boots for the family. The last thing i bought was a bottle of Biofreeze for my injured arm.